Barrel cut cushion are words that describe the cut of this Topaz gemstone but they don't begin to give you the real feel of this gorgeous gem. 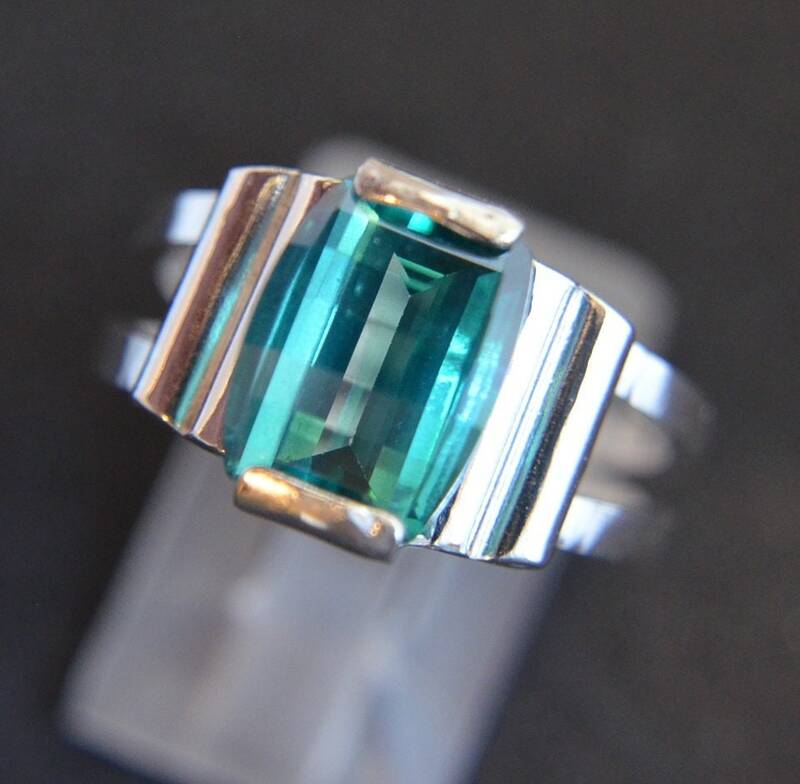 The barrel cut part is referring to the way the gem is faceted. Instead of the tiny cuts you normally see, this one has long cuts across the face of the stone. The gem has a curve to the surface so that all these lateral cuts catch the light and sparkle right back at you. Plus, they have beveled the curved edges to give it even more refractory power. This is by far my favorite cut of gemstone and one that you may not have seen. On top of the great faceting, the color of the gem is outstanding but hard to nail down. It's green with a touch of blue but will flit from shade to shade with the light as you can see in my pictures. Whatever name you want to give it, it's a deep rich color that will stand out on your finger. My pictures do not do it justice. If you think it looks good on your computer, wait until you see it in person! This beautiful Topaz is 10x8mm and 4.20 carats. With over four carats in the gemstone, I set out to make it still be comfortable for everyday wear. The Sterling Silver band is handmade by me. I started with two strips of silver to support the stone. On each side of the gem you will find two columns of silver. The straight lines of the band highlight the straight faceting of the stone. The setting that I chose keeps the stone very low profile making it so easy to wear. On the palm side the band is 3.5mm wide then tapers out to match the 10mm length of the Topaz. Life is too short to wear ordinary jewelry!